SUMMARY: Three years after the car accident that nearly killed his girlfriend Mia, Adam is still trying to figure out why she left him without an explanation. Now, Mia and Adam meet by chance for one night in New York City before both continue on their separate paths as accomplished musicians. REVIEW: As a huge reader of YA fantasy and sci-fi, I tend to struggle with very serious realistic fiction. It's not that I don't like it; I do occasionally read and enjoy realistic fiction. It's the really heavy, emotional/angsty realistic fiction that I struggle with. I just have to be in the mood for it, I guess. I read If I Stay a couple of years ago because so many reviewers raved about it. And though I enjoyed it for the most part, it really wasn't something I personally would rave about. Though the writing is beautiful, it's just so darn sad. 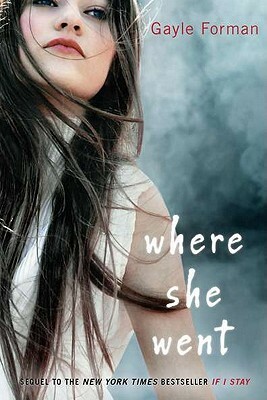 So I knew what I was getting into when I read Where She Went for much the same reason--that I kept hearing about how it's "even better than the first one" and that it focuses more on the relationship between Adam and Mia. Always a sucker for a good romance, I decided to give it a try. And, yes, I did enjoy this book. I read most of it in one sitting--always a good sign. I really liked Adam and believed in his downward spiral since Mia inexplicably left him. I rooted for Adam and Mia to be together, even though I felt that Mia came off as cold and unfeeling. The writing is fantastic, though I did find myself skimming over some of the "memories" parts. But did I love this book? Meh. I think I might have loved it more if I actually liked Mia. So what's my beef with the lovely Mia? Spoiler here--highlight if you want to read it-- What she did to Adam three years ago was heartless and cruel. She just left him? This wonderful guy who stood by her through everything and loved her and only wanted her to be happy? She just LEFT this sweet, hottie rock star who she loved without so much as a goodbye. I get that she was grieving and that her head was messed up at the time, but the reason she did it--once it is finally revealed--was so stupid. I didn't get that at all. So then, after three years, she finally gets the chance to make things right again. But does she take that chance? Well, eventually, yes. But before she does that, before she starts to stitch up the gaping hole she put into this poor guy's heart, she decides to parade him all over New York City in the middle of the night, saying nothing as their time together dwindles. I'm sorry, but she owes him more than that. Still, I did like the book, especially the way it ended. I can see why scores of readers rave about it, especially those who love realistic fiction. THE BOTTOM LINE: If you loved If I Stay, you won't want to miss Where She Went. It's great, emotionally-charged writing that will keep readers glued to the pages. STATUS IN MY LIBRARY: We have it though now that I have read it, I will be careful who I recommend it to. See my content notes below.